Patricia Spain Ward. Simon Baruch: Rebel in the Ranks of Medicine, 1840-1921. University of Alabama Press, 1994. This biography recounts the remarkable life of a Prussian/Polish Jew who immigrated to the United States as a teenager in the 1850s and became one of the nation’s best-known physicians by the turn of the century. After medical study in South Carolina and Virginia on the eve of the Civil War, Baruch served the Confederacy as a surgeon for three years, twice undergoing capture and internment. Despite economic hardships while practicing in South Carolina during Reconstruction, he helped to reactivate the State Medical Association and served as president of the State Board of Health. In 1881 he joined the exodus of southern physicians and scientists of that period, taking up residence in New York City, where he rose to prominence through his advocacy of surgery in one of the early operations for appendicitis and through is role as the protective physician in a widely publicized “child cruelty” case involving the musical prodigy, Josef Hofmann. Baruch became a leader in the nationwide movement to establish free public baths for tenement dwellers and in the development of expert medical journalism. Although his advocacy of such natural remedies as water, fresh air, and diet often made him appear unaccountably iconoclastic to his contemporaries, he has gained posthumous recognition as a pioneer in physical medicine. Bernard N. Baruch, one of his four sons, has memorialized this work through endowments for research and instruction in physical medicine and rehabilitation. 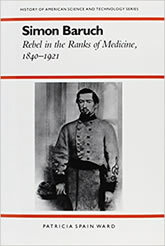 Ward reconstructs the life of a medical student in the South at the opening of the Civil War, the adventures of a Confederate surgeon, and the difficulties of a practitioner in Reconstruction South Carolina. Simon Baruch’s physician’s registers and his correspondence with colleagues afford the reader an immediate sense of the therapeutic dilemmas facing physicians and patients of his era. Baruch’s experiences while establishing himself in New York City after 1881 reflect the challenges facing those trying to break into what was then the nation’s medical capital—as well as that city’s rich opportunities and heady intellectual atmosphere. His energetic campaign for free public baths illustrates one of the most colorful chapters of American social history, as immigrants flooded the cities at the turn of the century. As medical editor of the New York Sun from 1912 to 1918, Baruch touched on most of the health concerns of that period and a few—such as handgun control—that persist to this day.